You can screw it up yourself or call Gossamer to fix your computer right. While there may be many that may offer to fix your computer, few have the 30 years of experience in the field of computer engineering that comes with the Gossamer name. 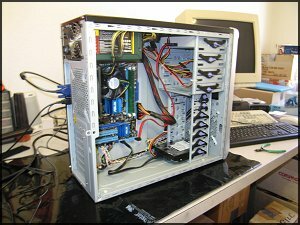 Not only will your computer get fixed right, we also provide many helpful hints and tips concerning the environment that your computer encounters, tips and advise that may well prevent future downtime. For example, did you know that running Microsoft's Critical Update software does not ensure that you will always have the very latest updates your computer needs? Ensuring that your computer is completely up to date is the single most important thing you can do to avoid potential computer attacks and viruses. One of our more popular services is to rebuild your Windows laptop. Years of use can often render a laptop unusable often times due to dozens or hundreds of software packages getting installed and deinstalled. Signs your laptop may need a rebuild is that you have run out of disk space, some of the normal functions no longer work, or work very slowly. Years of use can damage the window's registry, and year's of windows updates can clog up your disk drive. Often times, like a quirky Star Wars R2 unit, a memory wipe can restore your laptop to like new performance saving you hundreds of dollars on the purchase of a new laptop. Often we can install those updated drivers you never knew about increasing reliability and performance. A new windows install can fit in as little as 10Gb of disk space and give you plenty of room to install needed Internet Security tools and other valuable PC repair tools. You will think you bought a new PC and you will have gained several more years of services out of your hardware. Contemplating a hardware refresh cycle but are hesitant to go full Monty with the additional costs of Server 2008 and all new application software? Wary of spending thousands for mediocre hardware from that huge computer vendor? Gossamer can set you up with custom built hardware that will give your current office productivity a boost and lower your maintenance costs. Same software, new hardware. And your new hardware will be completely compatible with the very latest Microsoft can throw at you. 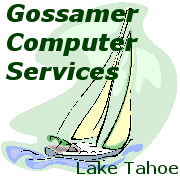 At Gossamer we can quickly diagnose your computer problems and fix them right. Whether your computer just has the slows or is just loaded with all kinds of freebie software that might cause problems, you can be assured that Gossamer will get to the bottom of your problems so that you may enjoy a trouble free environment.